If there was ever a film destined to become a cult classic, it would be ‘Filth’. Adapted from the novel by Irvine Welsh, its ballsy storytelling and abrasive oddness were never going to be an easy sell for mainstream audiences, but with its home entertainment release, the film finally has a chance to be seen by an audience far more likely to fall for its anarchic charms. Scottish Detective Sergeant Bruce Robertson (James McAvoy) is a man who thrives on chaos and indulgence. When a major promotion comes into play, Bruce begins to systematically take down his opposition as a smiling assassin, mostly for the sheer pleasure of the act, but also to impress his gorgeous but strangely absent wife Carole. The more chaos he creates though, the more Bruce’s already fractured mind begins to crumble, with disastrous results. Leading the charge with the film is a blistering performance from McAvoy, one of his finest to date. He attacks Bruce’s detestable personality with ferocity and bravery, the kind of performance that keeps you constantly on edge thanks to an actor who seems like he could strike viciously at any second. This is also a great description of the film itself - like a wild animal in a cage. It has no qualms about being incredibly funny, very confronting and totally immoral, and the further we go down the rabbit hole of Bruce’s psyche, the more insane the filmmaking allows itself to become. Credit goes to director and writer Jon S. Baird, not just in how he handles the crazy twists and turns of Welsh’s narrative, but in how he defies expectations in his filmmaking. Every time you think you have a grasp on ‘Filth’, it quickly runs in the opposite direction. There are moments where the insanity gets a bit too much, but it quickly returns to solid ground, thanks especially to terrific performances from the supporting cast, especially Jamie Bell, Imogen Poots, Eddie Marsan, Shauna Macdonald, Joanne Froggatt, Shirley Henderson and Jim Broadbent. Each is a cog in a very strange machine, but each make such a great impression and gives exactly the kind of talented support a great performance like McAvoy’s needs. ‘Filth’ is not a film that will appeal to everyone. It’s abrasive, offensive, messy, reprehensible and insanely bold. But if you like your cinema with a healthy dose of anarchy, don’t hesitate to check it out. Revisiting it on Blu-ray only confirms that this is one film that should have a long and happy life bringing joy and happiness to those of us who love films that allow us to indulge in our naughtier side. The visuals of ‘Filth’ are as messy as the film itself, and Icon’s 1080p 2.35:1 transfer accurately preserves the original texture of the film. Sequences move between crystal clarity to dirty and grimy to the soft-focus of hallucinations, and yet the transfer maintains a consistency of sharpness, and the colour balance is outstanding, vital for a film more akin to a Warner Bros. cartoon that any kind of realism. The DTS-HD MA 5.1 track is serviceable, but dialogue and sound aren’t as balanced as they should be. The dialogue can occasionally be difficult to make out, even more problematic with the strong accents in the film, but there are subtitles in case you can’t get the sound balance right at home. Every time you think you have a grasp on ‘Filth’, it quickly runs in the opposite direction. Unfortunately this is another Icon release without any special features. 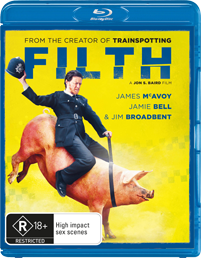 The UK edition offers a myriad of deleted and extended scenes, interviews with Welsh, Baird and McAvoy, and an audio commentary with Baird and Welsh. The fact these aren’t offered to Australian audiences is very disappointing. The 'Filth' competition has now closed. Winners will be announced shortly. Competition opens at 5pm AEDT on Sunday 30th March 2014 and closes at 11:59pm AEDT on Sunday 6th April 2014. Five winners will be chosen at random on Monday 7th April 2014. To successfully win, entrants must fulfil the above entry conditions before the time the competition closes. Current members/followers are eligible to enter the competition. Only one entry per person. Only one winner per household. To be a valid winner, the entrant must not have won a prize from SWITCH within the last 28 days. Each winner will receive one Blu-ray copy of 'Filth'. By entering, you agree to receive occasional emails from SWITCH in the future. If you decide to unsubscribe from these updates, any further entries will not be applicable. Only Australian residents are eligible to enter. 'Filth' is available on Blu-ray, Digital and DVD on Friday the 4th April 2014 from Icon Home Entertainment.